Yesterday, on day 13 of the power outage, having seen no activity in our neighborhood to clear the tree debris or restore power up to that point, it felt pretty good to come home to trucks lining the main street all the way down. It felt like hope. They were going to do it. They were putting a lot of manpower into it, not just a token crew or two. Sadly, it did not happen that night. The houses on the other side of the street got their electricity, but not our side. There were poles that needed to be fixed. It would take another day. Ok, we can go another day. An even fortnight. Get a little more use out of the generator. Today, we came home and watched them work on the poles. Then we watched trucks exit the neighborhood. It looked like it wasn't going to be tonight, either. But it was closer. I had Bach Choir rehearsal. When I came home, we had power. And internet service. What a relief! There's another section of our block where the poles are even worse off, and it will be another day or more for them. At least we can lend somebody a generator. We're fine. The house is fine. Hurricane Ike was more of a natural inconvenience than a natural disaster for our house. The part of the fence that has needed replacing for years was blown down and will finally be replaced. Other than that, no repairs on our property. You know why? No trees. But it sure would be nice to have electricity again. We live in an area you might expect to get power quickly: on the west side of town, very near the 610 loop. Not heavily-damaged, not way out in the suburbs. But we don't have much in the way of big retail centers to give us a high priority, and there are a number of trees down on lines, which does make the difficulty higher (pushing us down the priority list). Centerpoint expects us to be restored "by Thursday". My bet was Wednesday, Shelly bet Friday. Shelly was in Houston for Hurricane Alicia in 1983. She fondly* recalls 11 days without power. It appears we will be breaking that record, although we're a few weeks later, and thus don't have the oppressive heat they had. We bought a generator, to keep the deep freeze going. It also keeps the fish in our tank and pond alive, and gives us some light when it's dark out. But it doesn't run the air conditioner, and it's pretty balmy out. We're taking a lot of rinse-off showers to cool down. What did we do in the week after Ike hit? Well, first, we went out in the rain and raked debris out of the storm drains. Then out of the gutters. Our neighborhood drains pretty well, anyway, but it's always better to have the drain paths clear. Then we helped some neighbors clean up the debris (dropped from trees, of course) in their yard, cut up big limbs, that sort of thing. Over the next few days, we hosted several cookouts, to make use of perishables and get the neighbors together. They were pleasant, and I recommend that sort of thing as a coping strategy. Very positive. We didn't drive anywhere for several days. We weren't supposed to, so we didn't. Gasoline was in short supply, and traffic lights were generally out. Other people couldn't resist the urge to drive around. A lot. When we did take the car out, on Tuesday, it was because Southwest Fertilizer had generators, and we were ready to buy one. And later in the week, we bought some groceries. People who didn't prepare for the storm and thus had to leave home within the first three days to buy groceries. If you didn't prepare the way you were told to, you're part of the problem. Stay home. Don't use gasoline. Don't endanger people with your vehicle on uncontrolled, debris-strewn roads. Three days is not such a terribly long time to stay at home. People who were under mandatory evacuation orders who didn't leave and now are receiving top priority in relief efforts. The only assistance they should get is help getting out. We should not be channeling resources to areas that are supposed to be empty, we should be putting all efforts into restoring the areas where people were told to stay. People who blame Centerpoint for their miseries. Yeah, you don't have power. You and two million other people. Deal with it. Don't shout epithets at the people who are trying to help you. And don't hurl abuse at the people who are telling you which lane you have to drive in to get free ice. Grow up. You're not two anymore. Trees. Ok, not trees, generally. I like trees, generally. They're pretty. They sequester carbon. They give birds places to hang out, apart from power lines. But the notion of an "urban forest" has its drawbacks. Trees in and around power lines are bad. Brittle trees (Arizona ash, Chinese tallow), trees that shed lots of crap in storms (water oak), and ginormous trees (sycamore, pine) are all bad ideas around houses and expensive stuff. Our urban forest should be made of smaller trees. Pleading with Ike not to hit us, but knowing what's coming. I haven't been everywhere (man), but Shelly and I are planning to add a couple of states to our experience list: Vermont and Maine. Still haven't been to New York. 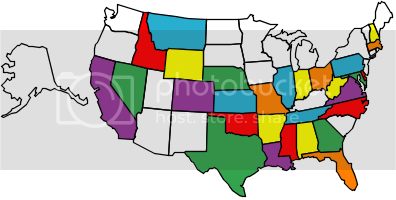 You can make your own visited states map here. I don't intend this to be a political blog, but I'm feeling the need to post something, and I have this idea in my head. Got others? Post 'em in the comments.